Addictive Mobile Dice Poker Game Dice Duel Is Now Called Dice Clubs : Play Dice Clubs! Dice Duel, the excellent mobile take on dice poker, is now called Dice Clubs. Bones. Ivories. Tombstones. Craps. Shakers. Dice have gone by many names in their long history on earth, and we’re about to lay a new one on you. In case you’ve never played either dice poker or Dice Duel – sorry, Dice Clubs – before, here’s how it works. You start with a set of dice combinations that you have to try and achieve by throwing five dice. Many of these combinations are loosely based on poker hands. For example, a full house is three of one number and two of another. A straight is four consecutive numbers. You get the idea. You get three throws per turn, and you can hold back dice from your previous throws. So, say you’re aiming for four of a kind and you get three 6s on your first throw – you can bank the 6s and just throw the other two dice. At the end of every turn you have to declare which category you’re ticking off. For example, if you have four 5s you can either declare them as a four of a kind or use them to tick off your 5 category. The luck is throwing the right dice. The skill is in judging which categories to go for in order to optimise your odds and maximise your score. So that’s how dice poker works. 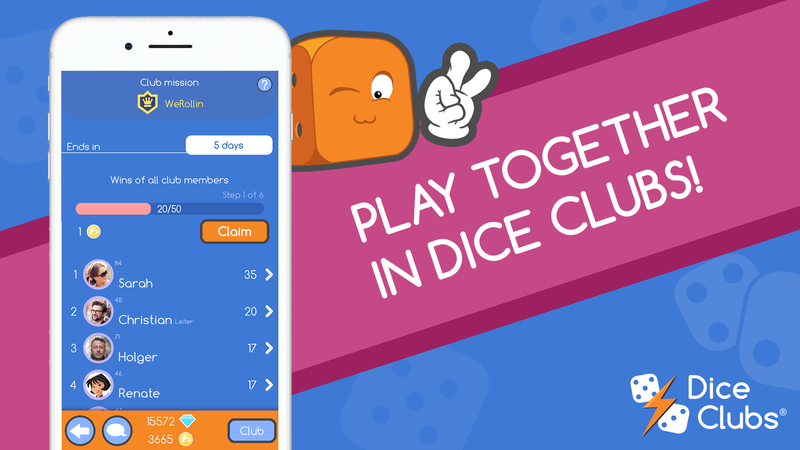 Dice Clubs takes that central gameplay mechanic and wraps it up an in impossibly slick casual mobile gaming package. You can have multiple games running at once, add friends, invite players, and jump into a variety of exciting modes – including the high stakes Dice Duel mode, where you play for consumable gems. It’s a great little package, and developer b-interaktive has enhanced more than just the name, adding a celebratory animation for when you get a 5x and emotes for players who want to communicate without the dusty old formality of words. All of the emotes are fully animated too, with all of them depicting the game’s mascot in a range of situations and outfits – just another touch that makes the game unique. Dice Clubs has been a great game since launch and has only been improving since arriving on the scene – and we suspect that this trend will continue if this update is anything to go by. Check it out for yourself by download it now for free on Google Play and the App Store.